Class of 2018, you’re almost there! In a matter of days, you’ll be loading up cars and stuffing bulky bags through airport security, ready to embark on an adventure that everyone says will change your life. They’re right, it will — but only if you let it. Venturing off to college — an oasis of four years, chock-full of highs and lows, discovery and friendship, some hard nights spent in the library and other nights that are, well, forgotten — is a coming of age tradition that bundles opportunity like no other place or time period can. Take full advantage of this unique privilege because, as someone who will soon be kicked off the island, I’ve seen it move heartlessly quick. Clean the slate; high school is over. Reevaluate your passions and find what it is that drives you to succeed. Peek over the hill and glance in the rearview, but mostly just enjoy the view of Eddie’s. Like most other places, Fordham stumbles every once in a while — and, trust me, there are plenty of crows on the wire to make note of when it does. But on the whole, Fordham has proven itself time and time again to be an honest institution that cares deeply for its students. Give it a chance. Make no mistake, Fordham is lucky to have you and you are lucky to have it. I suspect some of you are counting down the minutes until you escape the warm embrace of your family and finally begin to experience the college-life myths you’ve seen in movies. (Don’t set the bar too high.) Others may be hesitant to break away from longtime friendships and the comfort of a familiar routine. Perhaps you have a foot in both camps. Whatever the case, it’s worth remembering that you are not alone. In fact, hundreds of other kids will be arriving at Rose Hill and Lincoln Center for the first time on Sunday just like you. Spoiler: No one knows what they’re doing. Find comfort in that. To help with the transition, I compiled a listicle of some things to keep in mind as you settle in for the semester. Instead of rehashing the rhetoric you’ve heard on tours, I tried to make this as applicable as possible. Take what interests you and leave the rest. College = huge independence = wiggle room for experimentation = more shots than a young person can handle. Relax, many have been there before you. But it’s important to remember that if you or someone you’re with needs medical attention, Fordham will NOT punish you for seeking it. When you’re walking back from Tinker’s early one Saturday morning this fall and you see someone lying on the ground or throwing up in a bush — maybe they’re older or younger, or you don’t really know them — don’t think about the stake of your scholarship or how much trouble you might get into. In that moment, you have the opportunity to really help someone, and that’s what matters. Isn’t that like the whole Jesuit mission thing? In general, campus policy prohibits underage students from being “in the presence” of alcohol (or kegs, decorative shot glasses, “party balls,” etc.) or “in the presence” of a person — legally or illegally — consuming alcohol on campus (unless they are at an officially-sponsored event). Students who are 21 may drink in certain residence halls, though there are conditions. Some RAs will enforce the law, others will join in on the fun — I’ve seen it go both ways. [Read full policy details here] As you might expect, disciplinary action in this area depends on how far you stick your hand in the cookie jar. But discounting arguably ineffective policies, bystander intervention and old-fashioned leadership are the most effective tools when it comes to keeping your friends safe. It’s never fun to be the responsible one, but the impact of being a good neighbor can go a long way. As returning students have seen, you don’t need a student government title to be a leader. Let’s all lend a hand and look out for one another. 3. …but be careful with your phone. We had a bit of a problem last fall with boozy students getting their iPhones snatched by Bronx locals late at night. In fact, it became a kind of routine administrators and student leaders began reffering to almost endearingly as “Apple Picking.” The number of thefts spiked, which led to some violent encounters and Fordham finally got 50 NYPD officers to patrol the off-campus area for two weeks, which seemed to put a Band-Aid on the problem. You’ll continue to get security alert emails about such incidents. Use common sense and always be aware of your surroundings — whether you’re in The Bronx or Manhattan or Brooklyn — at 2 in the morning. 4. Sexual assault exists at Fordham. 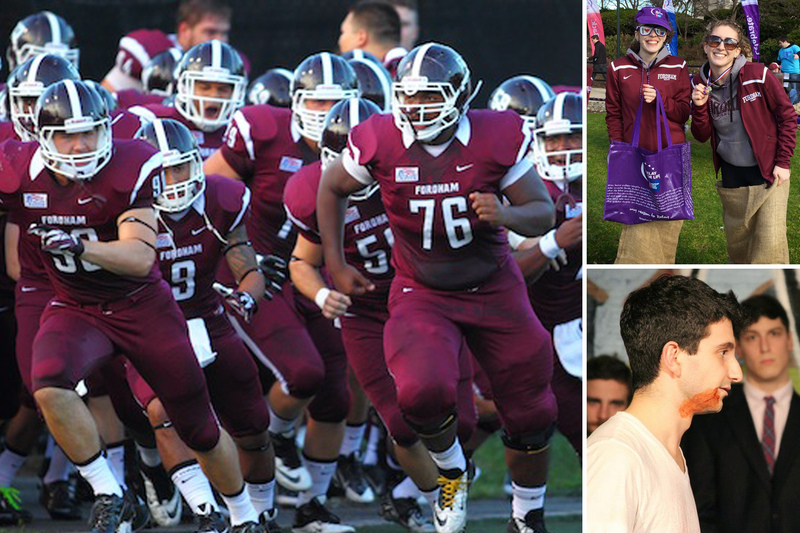 Like at every other college, sexual assault is an unfortunate part of life at Fordham. Twenty-three reports of on-campus sexual assault, and two off campus, came through Fordham’s Security Office between 2010 and 2012, according to federal data. Administrators had made three of those incidents public, leaving most cases known only by the relatively few involved. Fordham had more claims of sexual assault than any other Jesuit college during that time period, according to the number of claims reported. Last spring, administrators and student leaders came together to boost awareness of how sexual assault cases are handled on campus after I published those numbers in The Fordham Ram. A clearly defined, no-tolerance policy and a largely effective adjudication process kept Fordham off a federal inquiry filed last spring that set out to investigate sexual offense policies at 55 colleges across the country. Christopher Rodgers, Rose Hill’s dean of students, says preventing sexual assault on campus, much like alcohol abuse, largely comes down to being a good neighbor and looking out for the person next to you. “Beyond the expectation that we all afford one another the utmost respect, there is more each of us can do: Look out for friends when socializing, walk one another home or use Fordham vans especially at night,” he said via email. Trust your instincts: Honor your gut reaction even if you don’t know why you feel unsafe. If you are uncomfortable in a situation, leave immediately and seek help. Be alert: Being aware of people, surroundings and situations is the first step in preventing a sexual offense. Become familiar with your surroundings. Know how to contact police or campus security, and learn locations of public telephones and campus emergency phones. Think ahead: Become familiar with safety and prevention techniques, the university’s policy on sexual offense, and the procedure for reporting these incidents. 5. USG stands for United Student Government. Essentially, USG bridges the gap between students and administrators. If you want to impact change on campus, USG is a good place to start. Contrary to the haters, student government here has the potential to make significant change and greatly improve the campus community’s quality of life. I’ve seen it! But we need passionate leaders who are willing to get their hands dirty. Freshman elections will be coming up soon! Meetings are every Thursday at 6 p.m. in McGinley 237 and they are open to the public. At Rose Hill, the system is made up of an executive president, an executive vice president, seven vice presidents (each specializing in a particular aspect of campus) and four senators from each class (two from Rose Hill and two from Gabelli). 6. The food is probably not as bad as you’ve heard it is. Yes, in 2012 The Princeton Review said Fordham had the worst food of any college in the country. And no, we haven’t changed our food service provider. But most students say the food has gotten a lot better. Plus, a Starbucks just opened near Rose Hill. You should know that Fordham cafeteria food won’t beat your mom’s cooking or the fine pasta of Arthur Avenue, but it’s better than many have given it credit for. News for returning students: This year, you’ll be able to make your own s’mores at Cosi. More vegan, gluten-free options have been added to the Marketplace. The Grille has added “featured sandwiches” to its menu, as well as more staff to improve service speed. The “We Proudly Brew Starbucks” in Dagger John’s will open Monday – Friday at 8 a.m.
7. The cameras are watching. 8. It’s not weird if you go to church — or don’t. Hopefully by now you’ve heard that Fordham is a Catholic school, proud of its commitment to supporting the growth of men and women for others. Chapels abound on campus and theology is one of the subject areas all students must at least taste. But Fordham won’t shove religion down your throat. You have the freedom to decide whether Sunday night Mass is something you’d like to participate in. (Many do, but not all.) You are an adult now. Students of other faiths are also supported by the Campus Ministry office. 9. There are really talented/interesting people here. Encouraging you to go to football games is so unoriginal it’s almost painful. But it’s worth noting that there are some really talented kids on this campus doing some really interesting things. Immerse yourself in the culture by going to a game or a stand-up comedy show, or participating in a community service project or joining a club or driving a Ram Van. Take some risk and don’t miss out on what’s happening around you. 10. Your family will miss you. The deeper you fall into college life, the harder it may be to poke your head out of the sand and remember the people who helped get you here. But it’s important. Check in with your family, perhaps on a regular basis, because they care a lot and will no doubt miss your company. You may even miss them a little, too. PS – If you are feeling homesick or have any difficulty adjusting to campus life — don’t be fooled, it’s not easy for anyone — RAs are great people to talk to. Point of View is Connor Ryan’s opinion column.